I feel badly but I don’t know where I got this recipe. It’s from some book that Suzi and I have, but we have about five thousand cookbooks now and … It’s wonderful and I thank the creator. You know the story: things were always better in the past. Foods have dumbed down. Recipes have dumbed down. And the jalapenos? Well, they were hotter in the past. Or so many critics say. I must agree. At times. Lately the jalapenos just don’t seem to have the fire that make me sweat the way a chipotle does. Until now. Use this puree at your own risk! It’s hot, strikingly hot with just a touch of roasted garlic sweetness. You can use this puree anywhere: on main courses like roasted meats, on nachos, on your burger, … It’s as universal as mayonnaise. Just a lot hotter. Once you make this, it will store in your fridge for a month, your freezer for up to six months. Use often, but do use sparingly. It’s as hot as one of those real, old-time peppers. 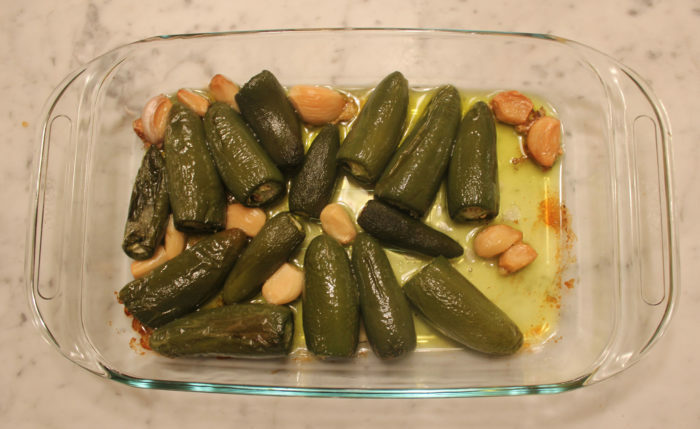 Place the jalapeno peppers and garlic cloves in a shallow baking pan in a single layer. Spoon the oil over all and turn to coat the peppers and garlic with the oil. Roast for 30 minutes. Turn and roast for an additional 30 minutes, or until the peppers and garlic are very soft. Cool. Transfer to a food processor and puree, adding the salt. Spoon the puree into ajar with a tight-fitting lid. Cover and refrigerate or freeze. Why do you add salt AFTER roasting? Typically, you add salt at the end after tasting to see if you even need it.